Saturn's moons Prometheus, Pandora and Epimetheus can be seen among the planet's rings in this image from the Cassini spacecraft. New views of Pan, Dasphnis, Atlas, Pandora and Epimetheus have suggested possible reasons for the strange shapes and colors of those moons. These moons likely coalesced from the planet's rings and get their color from either ice volcanoes or a mysterious red material in the rings, according to a new study. Saturn not only possesses extraordinary rings, but also more than 60 moons. A half-dozen or so of these moons appear linked with the giant planet's main rings, either lodged within these features or gravitationally interacting with them to sculpt their shapes and influence their composition. The ring moons often possess bizarre features; for example, Pan and Atlas are shaped like flying saucers. Saturn's moons can also vary in color from adjacent rings, and astronomers have questioned why these differences appear. The relationship between the planet's rings and these moons suggests that the rings' and moons' origins and continued existence are linked, researchers have said. Previous work suggested either that the moons coalesced from ring material or that the rings formed from the disintegration of a moon. 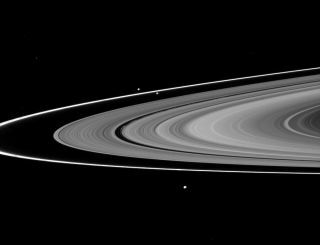 To shed light on the mysteries of these ring moons, scientists had NASA's Cassini probe perform five close flybys with five of these moons — Pan, Daphnis, Atlas, Pandora and Epimetheus — before the spacecraft ended its mission by diving into Saturn. Using data from six instruments onboard Cassini, the researchers analyzed the shape, composition, structure and environment of these moons. "This mission was not supposed to happen," Bonnie Buratti, lead author on the new study and a planetary astronomer at NASA's Jet Propulsion Laboratory in Pasadena, California, told Space.com. "Cassini was only supposed to look at Saturn and its rings and its magnetosphere during its grand finale, but we noticed that it would come close to Saturn's ring moons, and we argued we wanted to look at them. So, our findings here are like a bow on top of the Cassini mission." NASA's Cassini spacecraft inspected these five moons of Saturn during super-close flybys, learning how the rings have influenced their coloring and size. The scientists found that the appearance of these ring moons depended on their position with respect to the rings, with Pan the reddest and closest in of these moons and Epimetheus the bluest and farthest out. This suggested that the moons' appearance depended on two competing factors, the researchers said: contamination by a red material from the main rings, which could consist of a mix of iron and organic compounds, and showers of ice particles or water vapor from volcanic plumes originating on Saturn's moon Enceladus. The researchers also found that these moons had low densities. This suggested that the natural satellites originated from ring material accreting onto dense cores, sometimes collecting onto the equators of these moons, which would help explain the flying saucer shapes of Pan and Atlas. "The rings and these moons are really the same kind of object — the rings are made of small particles, and these moons are the biggest versions of these particles," Buratti said. "These moons continue to accumulate small particles, explaining the weird skirt-like features around their equators." The scientists detailed their findings online March 28 in the journal Science.